This lotion is a combination of beauty lotion and milk. With just this one bottle you can supplement your skin with the moisture and oil content it . 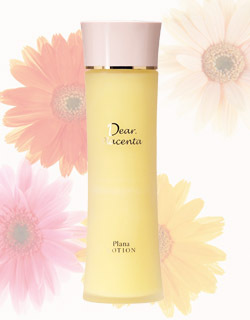 A two-in-one lotion combined with moisturizing toner and milky lotion with placenta extract. It also contains squalane and carrot oil and protects the skin’s natural moisture balance for beautiful skin. New Plana Lotion retains the old main ingredients such as placenta extract, squalane and collagen but has been modified to be soluble so that you don’t have to shake before use. In addition, nano ceramide (Unitika’s new technology), human oligopeptide (Nobel Prize winning ingredient EGF), hyaluronic acid and 15 kinds of amino acids have been newly added to the lotion. Shake well before use. Take desired amount of lotion on a clean palm and gently smooth over skin.